This year’s three-week, boutique race meeting, presented by Commonwealth Technology, will feature record purse levels. Horsemen can compete for $5.275 million in prize money offered in Director of Racing Ben Huffman’s 109-race September Meet condition book, which averages to $479,545 per day. Last year, an unprecedented $4.692 million was paid to horsemen for a daily average of $427,000, which was up 12% from the prior year. A total of 97 horses and four also-eligible entries were drawn Tuesday for Friday’s opener for a lofty average of 9.7 horses per race. The average field size during last year’s meeting was a September record 8.9 horses. The 10-race card features a trio of allowance races and two maiden special weights. The featured ninth race at 4:53 p.m., a $60,000 allowance/optional claiming event ($100,000 claiming tag) over seven furlongs, attracted a field of nine 3-year-olds, including Three Chimneys Farm’s Principe Guilherme, the Lecomte (Grade III) runner-up who’ll make his first start for Hall of Fame trainer Steve Asmussen since finishing seventh at odds of 5-2 in the Feb. 17 Risen Star (GII) at Fair Grounds. Five of his rivals are stakes winners, including Ellis Park Derby runner-up Kowboy Karma; last year’s Ellis Park Juvenile winner Dak Attack, who will make his first start in 251 days; Hutcheson Stakes (GIII) winner Madison’s Luna; and 2017 Arlington-Washington Futurity champ Barry Lee for Sagamore Farm’s new trainer Stan Hough, who will saddle his first starter since April 5, 2012. “Stanley Hough has been breaking the young horses for Sagamore Farm in Ocala, Fla. the past couple years,” Huffman said. “I just remember 20 years ago when he was training stakes winners all over the east coast and Florida. He’s a really good trainer and he’s going to train privately for the Sagamore Farm of Kevin Plank. He called me the other day and he will be here for all of September and Fall. He even mentioned he may be looking to buy a home in Louisville. With the Breeders’ Cup World Championships set to return to Churchill Downs during the 21-day Fall Meet on Nov. 2-3, several new trainers will have horses stabled at the Louisville track for the first time in many years, including Keith Desormeaux, two-time Kentucky Derby winner Nick Zito and newcomer Chad Summers. “A big part of the Breeders’ Cup being here at Churchill Downs is that we are going to have a lot of people that are trying to get a run over this track,” Huffman said. “When Breeders’ Cup is here, that always helps your stakes races. “Nominations haven’t even closed for the (Grade III, $200,000) Lukas Classic (for 3-year-olds and up at 1 1/8 miles on Sept. 29) but I can already tell you (three-time Grade I-winning sprinter and Whitney runner-up) Mind Your Biscuits’ next start will be in the Lukas Classic. Also, Toast of New York is coming from Europe to get a trip over the track prior to the Breeders’ Cup. Things like that helps our other stakes races. A major focus for many horsemen during the second of the year is the development of 2-year-olds. Friday’s eighth race, a $56,000 maiden special weight at one mile, attached 13 two-year-old fillies, and it’s the first of 16 maiden, allowance or stakes races for juveniles during the September Meet. The September Meet’s nine-race stakes schedule cumulatively worth $1.125 million kicks off Saturday with a stakes quartet, including two important 1 1/16-mile fixtures for juveniles that could produce starters in next spring’s Kentucky Derby Presented by Woodford Reserve (Grade I) and the Longines Kentucky Oaks (GI). The $150,000 Iroquois (GIII) kicks off the “Road to the Kentucky Derby” series (Top 4 Points: 10-4-2-1), while the $200,000 Pocahontas (GII) starts the “Road to the Kentucky Oaks” (Top 4 Points: 10-4-2-1). Also, both races are Breeders’ Cup “Win and You’re In” Challenge events, which means the winners will receive automatic berths in the starting gate for their respective Breeders’ Cup races on Nov. 2 at Churchill Downs with full entry fees and travel expenses paid. Saturday’s stakes foursome is completed by a pair of stakes for fillies and mares, the $100,000 Locust Grove (GIII) over 1 1/16 miles and $100,000 Open Mind at six furlongs. Entries for Saturday’s 11-race card will be taken Wednesday morning. The $200,000 Lukas Classic (Grade III), along with the $100,000 Ack Ack for milers (GIII), $100,000 Jefferson Cup (Listed) for 3-year-olds at 1 1/8 miles on turf and $100,000 President of the UAE Cup (GI) for Arabians 4-years-old and up at 1 1/16 miles, will be the featured events on Saturday, Sept. 29 – the lone Downs After Dark Presented by Budweiser night racing event of the September Meet and last one of the year. The event theme that evening will be Bourbon & Beats and guests are encouraged to wear shades of purple and stay on trend with autumn fashion as they celebrate a pairing of Kentucky sounds and spirits. Opening weekend weather in Louisville will be ideal, according to the National Weather Service, with a forecast of sunny skies and temperatures in the mid-to-upper 80s. Churchill Downs’ 11-day meet will be staged over three weekends through Sunday, Sept. 30 with racing on Thursdays, Fridays, Saturdays and Sundays. The first race will be 12:45 p.m. daily (admission gates open at 11:30 a.m.) with the exception of a pair of 5 p.m. (gates at 4 p.m.) Twilight Thursdays and a 6 p.m. first post (gates at 5 p.m.) on Saturday, Sept. 29. The two Twilight Thursdays will feature $1 beer, live music (Sheryl Rouse Band on Sept. 20 and Roadie on Sept. 27), food trucks (Flavaville, Red Top Gourmet Hot Dogs, Zoom Zoom Yum, Mark’s Feed Store and Pollo), and lawn games (Snookball, Corn Hole and Giant Jenga) in Churchill Downs’ Plaza from 5-8 p.m.
Family Adventure Day Presented by Kroger is scheduled for Sunday, Sept. 23. 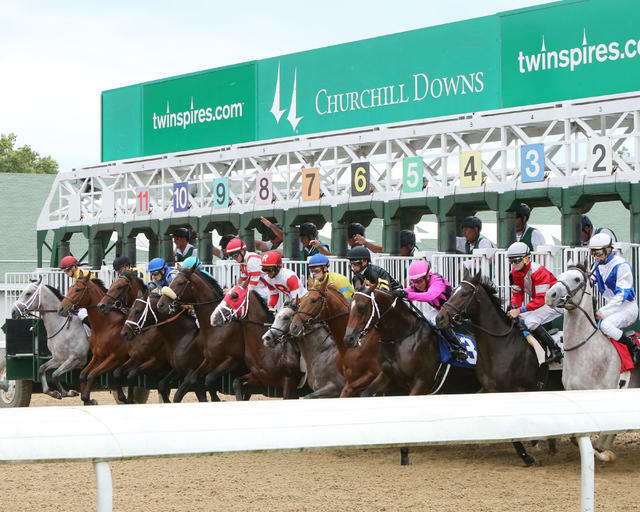 Families are encouraged to bring the kids to Churchill Downs for a day of racing and family activities including pony rides, inflatables, petting zoo, stick horse races on the turf course, face painting and more. The theme is “Be Creative!” and special happenings include science activities from The Kentucky Science Center; arts and crafts with Side by Side Studio; a mobile recording studio with AMPED: The Academy of Music Production, Education and Development; practice printmaking basics with KMAC; and interaction with the Kentucky Department of Agriculture. The betting menu will be the same as recent meets and includes the 20-cent minimum “Single 6 Jackpot,” which is offered on the last six races each day with a low 15-percent takeout. The Single 6 Jackpot will be paid out only if there is a single winning wager with six winners placed at the required minimum bet value. If there are multiple winning wagers with six winners in the six-race sequence, 90 percent of the net money wagering into the pool will be paid out, and the remaining 10 percent will carry to the Single 6 Jackpot. If there are no tickets will all six winners, 100 percent of the pool will carry to the Single 6 Jackpot. There will be a mandatory payout on closing day. Veteran jockey Corey Lanerie, fresh off of winning the Ellis Park riding title with 30 winners, had the hot hand during last year’s September Meet with a record 25 wins, 15 more than Florent Geroux and Brian Hernandez Jr. Hernandez defeated Geroux, 43-38, during the Spring Meet for his first local leading rider title. Fifteen-time Churchill Downs champion Lanerie was third with 35 wins but missed the final seven racing days following the sudden death of his wife Shantel. The lone Senior Day of the September Meet at Churchill Downs is scheduled for Friday, Sept. 28. Guests 60 and up can enjoy lunch and a day at the races in Millionaires Row for only $24. On Sundays, Churchill Downs is offering a special “Stakes and Eggs” brunch special in the Stakes Room. The $45 package for adults and $22 package for children includes a seat in the Stakes Room on the fourth floor of the Clubhouse and all-you-can-eat access to the brunch menu that includes an omelet station, scrambled eggs, biscuits and country gravy, French toast, hot brown, carved country ham, crispy bacon, sausage patties, hash brown potatoes with peppers and onions, fresh fruit, garden vegetables, breakfast breads and a chef’s dessert display. Travis Stone will describe the racing action throughout the September Meet Presented by Commonwealth Technology with Joe Kristufek serving as a paddock analyst. Veteran odds maker Mike Battaglia has morning line odds duty for the 44th consecutive year.